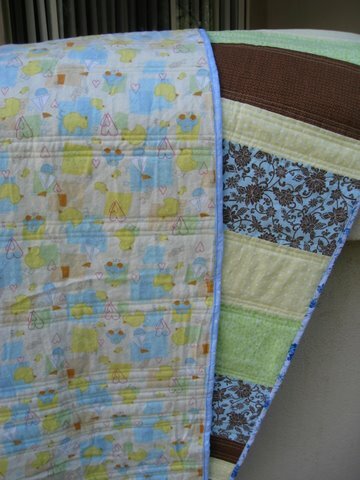 I have three lovely baby quilts resting on a chair in my living room, waiting for delivery. (Ha, delivery, get it? 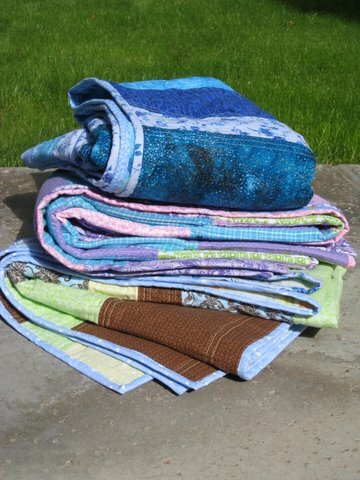 Delivery of baby quilts!) Two are for women at Maggie’s Place, an organization that provides housing, resources, and support for women who are pregnant and often homeless. I have trouble with their value “Protecting the life of the born and unborn child and providing options for women that choose to give life” because of the “unborn child” and “give life” parts — I firmly believe in the rights of all women to make decisions regarding their bodies, their lives, and their medical procedures, including abortion. So for now I focus on the options for women who have already chosen, and hope that they truly had a choice. I designed the quilts for the specific recipients’ preferences. One problem: their babies were due in December 2009 and January 2010. Um, yeah, not such a great job there, self. 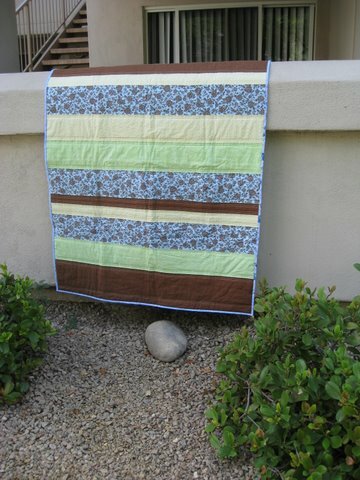 The alumni coordinator has contact info for one of the mothers and the other has lost touch, so unfortunately she won’t receive her quilt with brown, blue, yellow, and baby prints as requested. Somebody else will get it, though, somebody who hopefully likes the same things and will squeal with delight when she sees the baby duckies on the soft flannel back because I guess some people are into that kind of cutesy thing. I’ll do better next time. I can’t change the past, I can only change my actions in the present and decisions in the future using the knowledge I’ve gained from my mistakes in the past. This message brought to you by regret, hope, the number 2, and the letter B.
November 12, 2010. 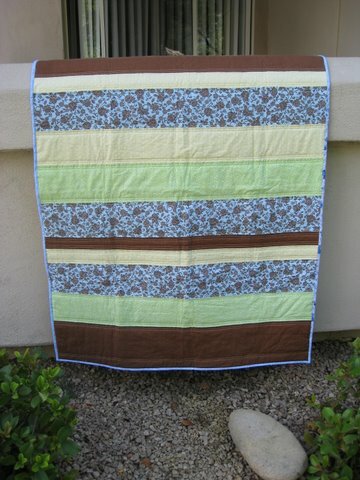 Tags: baby quilt, blue and yellow, completed project, quilt, stripes. Pictures, Projects, Words.